We assess the potential supply of natural gas in the U.S.
2. current or foreseeable technology. The assessments are “base-line” estimates in that they attempt to provide a reasonable appraisal of total U.S. natural gas resource potential—an appraisal that is not subject to the assumptions of the time of development of the resource, life span of the natural gas industry, or specific price to be paid for the produced gas. No consideration is given whether or not this resource will be developed; rather, the estimates are of resources that could be developed if the need and economic incentive exist. Furthermore, they assume neither governmental or regulatory restraints upon development and production of the resource nor the effects of access factors such as availability of pipeline connections. The Potential Gas Committee’s assessments do not include, and are distinct and separate from, the volumes of proved reserves contained within the nation’s discovered fields. Annual reports of proved reserves of natural gas in the United States were prepared, from 1946 through 1979, by the American Gas Association’s Committee on Natural Gas Reserves (CONGR). Prior to 1995, CONGR published annual reports of proved reserves for selected fields. (footnote 1) Since 1977, annual assessments of proved reserves have been prepared independently by the U.S. Department of Energy’s Energy Information Administration (EIA). (2) These estimates are, by definition, limited to those proved recoverable reserves of natural gas that have been established by drilling. Consequently, these estimates do not reflect potential resources of natural gas that may be discovered as a result of future exploratory drilling. It is the assessment of these potential resources that is the mission of the Potential Gas Committee and that are discussed in this report. 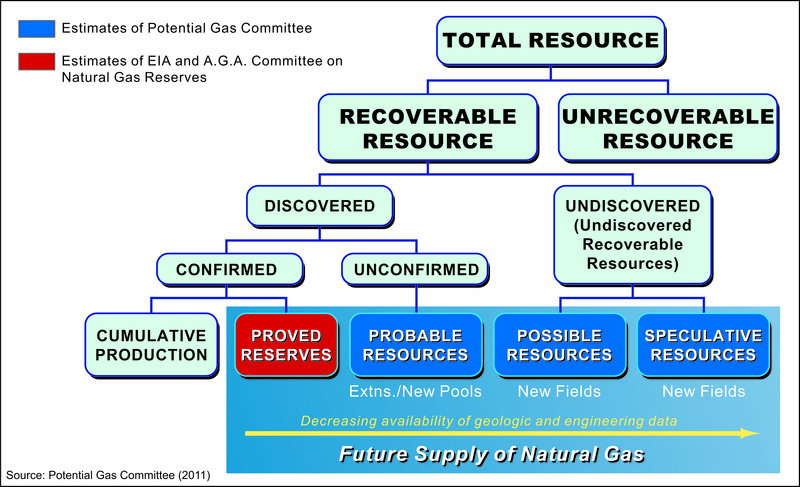 The relationship between proved reserves and the several categories of potential natural gas resources is illustrated in Figure 1 and detailed below. Furthermore, the PGC’s assessments do not include natural gas that may be recovered in the future from sources not currently recoverable with existing or foreseeable technology and under current or foreseeable economic conditions. Examples of these “frontier” occurrences include natural gas hydrates (which are discussed in an earlier chapter of this report), gas in geopressured-geothermal accumulations, deep-earth gas, and gas contained in extremely low-permeability formations and not recoverable with existing or foreseeable technology. PGC members monitor industry’s interest in and investigations of these special categories of natural gas so that, as technology and economic conditions change, they can better assess the feasibility of including such occurrences in future resource assessments. In the interim, the PGC may present discussions of these gas occurrences in its biennial report as special chapters under the general theme, Frontier Gas Resources. For example, natural gas hydrates have been discussed in each PGC report since 1998. Many of the changes in resource assessments between the PGC’s successive biennial reports are represented by the additions to proved reserves during the preceding two years. These reserve additions, which are estimated by Committee members based upon available data, are then removed from the appropriate resource categories. Decreases in assessments of Probable resources occur as a result of field development and additions to reserves resulting from subsequent extensions of the producing area of a particular pool or field (Figure 1). Additions to Probable resources, on the other hand, are made based upon areas of fields that have been discovered and are under development at the time the assessments are prepared. Declines in Possible resources arise from new field discoveries, while increases result from new areas or prospective formations that are demonstrated to be productive of natural gas. Similarly, assessments of Speculative resources may be reduced upon new field discoveries and may increase if new data indicate additional, previously unrecognized potential for natural gas discoveries and production. Substantial changes in resource assessments, especially for Speculative resources, occur most often in frontier areas, such as some offshore regions (outer continental shelves and slopes), deep areas of onshore basins, Alaska and parts of the Rocky Mountain states. These changes reflect the uncertainty of resource assessment in cases where geological and geophysical data are limited or where the results of new exploration may further our knowledge and advance our interpretation of the nature and occurrence of the resource. Natural gas, as used in this report, is any gas (at conditions of standard pressure and temperature, 14.73 psia and 60°F) of natural origin and consisting primarily of hydrocarbon molecules producible from a borehole. Most natural gas also contains variable proportions of nonhydrocarbon gases, principally carbon dioxide, hydrogen sulfide, nitrogen and helium. In assessing potential supply, it generally is not feasible to quantify and exclude small proportions of these components from the hydrocarbons; however, in areas where substantial volumes of nonhydrocarbons are known or believed to occur, only the hydrocarbon components are included in the assessments. A finite volume of natural gas in place exists within the rocks of the shallow part of the earth’s crust. This finite volume of gas in place is the total natural gas resource. The amount of this resource that is recoverable is a function of technology and economics. The categories of this resource are shown in Figure 1. Today, technologies have advanced or otherwise improved to the degree where more of the natural gas resource base can be recovered than ever before. A major proportion of this resource is, however, dispersed throughout the earth’s crust in such minute accumulations or under such conditions that it cannot be extracted with existing or foreseeable technology. Furthermore, the cost of recovery of such gas would be too high compared to the value of the gas itself. Even with anticipated advances in technology, production of some accumulations still would be unfeasible because their recovery would consume more energy than that provided by the gas produced. The recoverable resource then is that part of the total resource that is susceptible to discovery and amenable to production during the life of the industry using current or foreseeable technology and under favorable price/cost ratios. Figure 1. Natural gas resource classification. These limitations of accumulation size and economics are applied as follows. For cases in which a distribution of sizes of individual accumulations is envisioned (particularly in the assessment of Probable and Possible resources, described below), a minimum size of recoverable accumulation is determined on the basis of the assessor’s judgment of the current relationship between the value of the resource and the costs of drilling and production. This relationship is based on extrapolation of the prevailing price/cost ratio at that time for the given geologic province and depth. This is often expressed as the minimum recovery per well that is necessary for an operator to determine if a particular well is economically feasible to complete and produce. Such a well may not, in total, be an economically viable venture, but given that it already has been drilled to a target horizon, the available resource will be produced and probably will recover the costs of completion and production, even if the total costs of exploration and drilling are not recovered. At the other end of the spectrum, a maximum size of accumulation is determined on the basis of the assessor’s evaluation of the geologic factors controlling the size and effectiveness of traps and the reservoir conditions. The limitations are evaluated in a more general way when the number and sizes of individual accumulations cannot be estimated—in particular, for the assessment of Speculative resources (discussed below). In this case, analogies may be drawn with provinces or formations from which natural gas production has been established and whose geologic characteristics are similar to the unexplored province or formation. The PGC hopes that, if this approach is conducted carefully and accurately, analogous conditions of size and economics will apply. The Recoverable Resource consists of both discovered and undiscovered natural gas resources. Discovered gas is the quantity produced historically plus that proved by drilling and engineering tests and included in present proved reserves. Discovered gas also includes the gas remaining in known fields that will be recovered through extension and complete development of known pools and reservoirs. The undiscovered resource is the potential gas supply that could become productive with further exploration and development. The undiscovered resource includes both the gas remaining in undiscovered pools and reservoirs within known fields and the gas that may be discovered in new fields and reservoirs within provinces that are presently productive and those as yet unproductive. Subdividing the recoverable resource in this way reflects the variation in the amount of geologic and engineering information on which the estimate is based. The categories are independent of any interpretation of development and production costs. From left to right in Figure 1, the level of geologic and engineering knowledge decreases. The definition of proved reserves varies among reporting organizations as well as among individual companies. Definitions adopted by the Society of Petroleum Engineers(5) restrict proved reserves to reserves that are supported by actual production or formation tests and by extrapolation of such tests to drilled and undrilled locations. Proved reserves are further restricted to those commercially recoverable and marketable under existing economic conditions at the time of the estimate. Furthermore, either the operational facilities to process and transport the reserves to market, or a commitment to install such facilities must exist. Under these definitions, and with the prevailing economic conditions in the natural gas industry in recent years, some companies have removed reserves from this category—in particular, on the North Slope of Alaska. EIA and CONGR, on the other hand, exercise more latitude in their application of economic yardsticks and in their consideration of processing and transportation facilities; thus, they have retained estimates for proved reserves on the Alaska North Slope. Obviously, these different approaches leave the status of some proved reserves uncertain. Because the Potential Gas Committee attempts to ensure that its assessments coordinate with those of EIA and CONGR, PGC has excluded those proved reserves included by EIA and CONGR. PGC’s assessments of potential resources include all the undiscovered gas resource plus that part of the discovered resource that is not included in proved reserves (Figure 1). Three categories of potential resources are recognized and reported—Probable, Possible and Speculative. They are differentiated based on the availability and reliability of geologic, geophysical and engineering information. Both nonassociated gas and associated or dissolved gas are included in all categories. Limitations to the assessments have been established by the PGC on the basis of current technological capabilities and our evaluation of the expansion of those capabilities in the foreseeable future. For example, no assessment is made for natural gas that might exist at onshore drilling depths in excess of 30,000 ft. Assessments for onshore areas are made for two vertical drilling-depth intervals, 0 to 15,000 ft and 15,000 to 30,000 ft, in recognition of the greater costs and technical requirements for drilling and completing wells below 15,000 ft. Similarly, no assessments are made in offshore areas of any natural gas that might exist beneath water depths greater than 1,000 m (3,280 ft), except for U.S. territorial waters in the deep Gulf of Mexico (province P-945). Separate assessments are made for offshore resources at water-depth intervals of 0 to 200 m (0 to 656 ft) and 200 to 1,000 m (656 to 3,280 ft) because of the higher costs associated with constructing, siting, installing and operating drilling platforms, production facilities and pipelines in deep water. Probable resources are associated with known fields and are the most assured of potential supplies. Relatively large amounts of geologic and engineering information are available to aid in the estimation of resources existing in this category. Probable resources bridge the boundary between discovered and undiscovered resources. The discovered portion includes the supply from future extensions of existing pools in known productive reservoirs (Figure 2, accumulation type ). Although the pools containing this gas have been discovered, their extent has not been completely delineated by development drilling. Therefore, the existence and quantity of gas in the undrilled area of the pool are as yet unconfirmed. The undiscovered part is expected to come from future new pool discoveries within existing fields either in reservoirs productive in the field  or in shallower or deeper formations known to be productive elsewhere within the same geologic province or subprovince . Figure 2. Hypothetical cross section illustrating categories and types of occurrence of potential gas resources. Possible resources are a less assured supply because they are postulated to exist outside known fields, but they are associated with a productive formation in a productive province. Their occurrence is indicated by a projection of plays or trends of a producing formation into a less well explored area of the same geologic province or subprovince. The resources are expected to arise from new field discoveries, postulated to occur within these trends or plays under both similar  and different  geologic conditions—that is, the types of traps and/or structural settings may be either the same or different in some aspect. Speculative resources, the most nebulous category, are expected to be found in formations or geologic provinces that have not yet proven productive. Geologic analogs are developed in order to ensure reasonable evaluation of these unknown quantities. 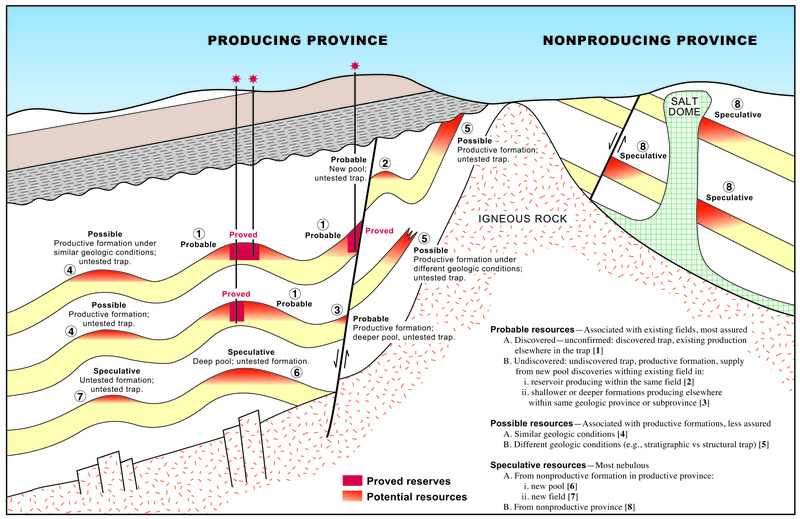 The resources are anticipated from new pool  or new field  discoveries in formations not previously productive within a productive province or subprovince and from new field discoveries within a province not previously productive . To reiterate, the accuracy of potential gas resource assessments depends upon the nature and knowledge of geologic conditions and upon the extent to which a particular area has been explored and developed. Members of the Potential Gas Committee maintain consistency and compatibility in their assessments by following the established estimation guidelines as closely as possible. However, a member may need to modify slightly the considerations and procedures when compiling assessments for each of the three resource categories because of the particular characteristics applicable to that respective reporting area. The assessments presented here are limited to the contiguous United States, Alaska and adjacent offshore continental shelf and slope areas. Hawaii, the island territories and their respective offshore areas are not included. No potential supply of natural gas is presently included that may exist at onshore subsurface depths below 30,000 ft. Separate evaluations are made for potential supplies at onshore vertical drilling depths above 15,000 ft and between 15,000 and 30,000 ft. These subdivisions recognize the greater technological challenges and economic thresholds inherent in recovering resources that exist below drilling depths of 15,000 ft. Assessments of natural gas lying within U.S. jurisdictions offshore are prepared based on water depths (different from subsea drilling depths). Assessments for water depths less than 200 m (0 to 656 ft) essentially represent the potential supply that may be recovered from beneath the Outer Continental Shelf (OCS), whereas water depths of 200 to 1,000 m (656 to 3,280 ft) correspond to the Continental Slope. Water depths greater than 1,000 m represent the Outer Continental Slope and deep (abyssal) ocean basins. However, no potential gas supply presently is included that may exist beneath water depths exceeding 1,000 m, with two exception. First is the deepwater Gulf of Mexico, where a separate assessment is included for water depths greater than 1,000 m within United States’ territorial waters (province P-945, Gulf of Mexico Outer Continental Slope). Second is the Southwest Bering Sea Slope (province P-980) in Alaska, but the Committee has not actually assessed discrete resources there for lack of data. Assessments by the Area Work Committees include resources beneath areas presently withdrawn from mineral entry by the government, proposed for withdrawal or otherwise subject to restricted entry. Where considerable potential exists beneath these areas, it is appropriate that assessments of the potential be made and presented in the respective area summaries. One exception should be noted. No assessments of potential gas supply have been developed separately for those areas of the Great Lakes within United States’ jurisdiction. Present federal and state regulations bar offshore platforms in the U.S. Great Lakes, and state regulations prohibit new sublacustrine directional or extended-reach drilling from lake shorelines. These restrictions are surprising in that offshore gas production in Canadian (Ontario) Lake Erie and Lake St. Clair have taken place since 1913 without serious problems. More than 500 gas wells produce there. According to a recent assessment by the Interstate Oil and Gas Compact Commission,(8) as much as 4 Tcf of technically recoverable natural gas—not an inconsequential volume—as well as 270 million bbl of oil may lie off-limits within the U.S. Great Lakes. The U.S. Geological Survey (USGS) has estimated recoverable resources of 5.23 Tcf of gas, 312 million bbl of oil and 122 million bbl of natural gas liquids (mean values) in various Paleozoic conventional and shale reservoirs beneath all the lakes except Superior. (9) More than one-half of the USGS’ gas assessment (3 Tcf) lies beneath Lake Erie, and Michigan and Ohio together account for nearly 80 percent (4 Tcf) of the assessed gas resource. The PGC is considering designating one or more offshore provinces for the U.S. Great Lakes jurisdictions as a prelude to further demonstrating the substantial resource potential of these offshore areas. Economic, technological and governmental policy considerations taken into account in the PGC’s estimates are related to (a) past production and proved reserves of natural gas; and (b) all wells that would be drilled in the future under assumed conditions of adequate economic incentives in terms of price/cost relationships and current or foreseeable technology. New technologies and improvements to existing technology that were not foreseen are reflected in future PGC estimates as a result of the two-year cycle of reporting. 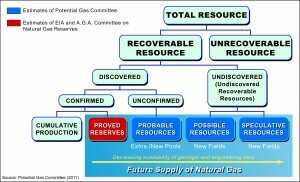 Fundamental economic considerations—including but not limited to prices, costs, rates of take, recovery factors and abandonment pressures—are inherent in the definition of proved reserves: “… recoverable in the future from known oil and gas reservoirs under existing economic and operating conditions.” Some gas that is actually present in known reservoirs is not producible because of unfavorable present or foreseeable price/cost relationships and, therefore, is not included in recoverable reserves. Furthermore, other known gas accumulations are so small that no gas can be produced in commercial quantities under “existing economic and operating conditions.” Because of such considerations, some proved reserves are less than the total volume of gas existing in known reservoirs. These same limitations are applicable to estimates of potential resources. If a fundamental change in economics or technology occurs, estimates of potential resources will be changed accordingly. The attribution technique presented earlier describes relationships between ultimately recoverable volumes of gas from known occurrences and prospective gas accumulations, after adjustment for variations in geological and reservoir conditions. The explicit assumptions of adequate but reasonable prices and normal advancements in technology in the definition of potential resources relate to improvements in exploration and production techniques. Adequate prices, normal technological improvements and reasonable governmental policies are all required to bring about the drilling necessary to prove the potential resources. 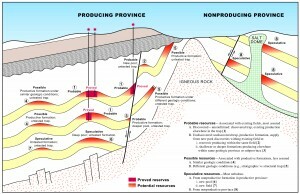 These assumed conditions permit the PGC to make estimates of potential resources on the basis of relevant past history and experience with respect to recovery factors, as well as the size and type of reservoirs that have been found, developed and produced, without speculating as to future levels of prices and costs. Methane is the principal hydrocarbon gas constituent evolved during coalification, that is, the slow transformation of peat by chemical reactions into coal. Coal is known to be the source rock not only for gas (and some oil) adsorbed within the coal matrix itself but also for natural gas that has migrated out of the coal and become trapped within adjacent porous and permeable conventional reservoirs (sandstones). The gas contained within the latter, although sourced from coal, generally is not volumetrically determinable and therefore is included within the overall Area assessments for traditional resources. Gas trapped solely within coal seams is considered “coalbed natural gas” and is assessed separately. Coalbed gas has become an important source of pipeline-quality gas. Beginning in the 1980s, production of gas directly from coalbeds was facilitated in large part by the IRS Code Section 29 tax credit (1984 Tax Reform Act), which expired in 2002. San Juan, Black Warrior and Powder River are the most productive basins, but output is increasing rapidly in the Central Appalachian, Arkoma, Cherokee and Raton basins, and notable developments are under way in the Greater Green River, Northern Appalachian, Forest City and Illinois basins—all without benefit of a tax credit. The Potential Gas Committee’s assessments of recoverable coalbed gas are reported separately because of the general sparsity of long-term production and recovery data. Reliable production histories spanning at least five to ten years are publicly available from only several basins. However, new field developments and production established and growing now in other basins are continually adding to our knowledge base, as are evaluations and limited field testing that are under way in as-yet nonproducing coal fields. Coal-bearing areas evaluated by the PGC include 27 coal regions, basins and fields designated by the U.S. Geological Survey that coincide or correspond closely with one or more PGC provinces in the Lower 48 States. Alaska is treated as one coal region, although USGS and the Alaska Division of Geological and Geophysical Surveys have identified at least fifty coal fields and other occurrences in various tectonically disparate settings. Coalbed gas resource assessments are based on volumetric calculations. The net thickness of prospective coal seams below some given depth, above which the entrained gas is considered to have been essentially lost to the atmosphere, is multiplied by area and coal density (a function of coal rank and ash content) to yield the tonnage of gas-bearing coal in place. In areas where information is lacking, the total quantity of coal in place has been estimated from USGS’ Coal Map of North America. (10) Tonnage is then multiplied by gas content (in standard cubic feet per ton, scf/ton, or cubic centimeters per gram, cc/g), which is most often determined from desorption and adsorption tests on coal core samples, to derive the in-place coalbed gas resource. Where measured data are unavailable, gas content may have to be estimated from available isotherms of tested coals of similar rank, quality and depth. Finally, to estimate recoverable resources, a range of recovery factors and other parameters, such as perceived maximum producible depth, may be applied to the in-place estimate. In the few cases where adequate gas-production histories may be available for a field or basin, remaining recoverable resources may be estimated by performing conventional statistical analyses of production decline, using historical production and other data, to derive estimated ultimate recovery (EUR). A key factor in coalbed gas resource assessment is the judgment of the Coalbed Natural Gas Work Committee members, strengthened by their knowledge and experience. Their use of the resource categories and assessments—minimum, “most likely” and maximum—reflects the range of uncertainties characterizing each. Consequently, the reader should not apply a single recoverable resource number without acknowledging the range of possibilities and uncertainties. The “single answer” can be misleading when dealing with the risks and uncertainties inherent in assessing recoverable resources, especially with an “unconventional” or “continuous-type” accumulation such as coalbed gas, with its relatively brief production history and still unresolved questions about the ultimate performance of coalbed reservoirs. Three categories applicable to assessment of recoverable coalbed gas resources have been established, as follows: Probable resources of coalbed gas are determined to be recoverable through future extensions of areas of current development. These resources do not include quantities currently estimated as proved reserves, but they occur under similar conditions and in proximity to currently developed and tested reserves. Reliable data generally are available for such factors as seam thickness, gas content, coal rank and production history. Possible resources are estimated to be recoverable in the future from individual gas-prospective seams or groups of coal seams with established gas production and reliable data on gas content and coal rank but from areas outside the areas of current development and production. Speculative resources are estimated to be recoverable in the future from basins or groups of prospective coal seams with, as yet, no established gas production. Data on coal thickness, gas content, coal rank and other characteristics generally are lacking or incomplete and must be extrapolated. The minimum, “most likely” and maximum assessments of Probable, Possible and Speculative resources of coalbed gas at the province/basin level are summarized in separate entries in each Area summary table (where assessed) but are excluded from the respective sum of the “most likely” assessments of traditional resources and from the statistically aggregated means. A separate summary of coalbed gas assessments by coal region and basin is given in the chapter, Natural Gas Resources in Coalbeds and Shales. We emphasize that all assessments of coalbed gas contained in the PGC’s tabulation represent the recoverable part of the estimated in-place resource calculated by the Coalbed Natural Gas Work Committee members in each basin evaluated. Both coalbed gas and shale gas are commonly considered “continuous-type” unconventional gas accumulations. The nature of the occurrence of natural gas in these self-sourcing reservoir types is similar, as are the laboratory methods for determining the gas-sorptive capacity of each. However, the types of organic matter from which hydrocarbons are generated contrast—that in coals being terrestrial in origin while that in shales is predominantly marine derived and secondarily lacustrine. The PGC cannot at this time present a detailed shale-gas resource assessment procedure, as it has for conventional and coalbed gas. PGC members likely use a procedure similar to that for coalbeds, but variations most certainly also are incorporated, especially for those plays that contain abundant hydrocarbon liquids. Like coalbed gas, PGC members do assess minimum, “most likely” and maximum values for their resource distributions. From these distributions, Area subtotals and a U.S. Grand Total are derived by arithmetically summing the “most likely” values. The preceding chapter includes the summary tabulation of the PGC’s current shale gas resource assessments, by province, which are also itemized under the “Traditional” resources headings within the respective Area resource assessment tables. The Potential Gas Committee has reported the resource assessments for the seven Work Areas and the national totals by arithmetically summing the most likely values—that is, the value of the statistical mode or the estimate with the highest probability of occurrence. Although this approach has given a reasonable picture of the total of the estimates for purposes of comparison with previous PGC assessments and those of other estimators, it has not accounted for the fact that the data provided by PGC members—the minimum, “most likely” and maximum values—are not pure numbers. Rather, they comprise a statistical distribution. Each of the values that make up this distribution has a varying probability of occurrence. Furthermore, the distributions most often are not mathematically dependent and therefore may not be rigorously summed arithmetically. The year-end Area totals of combined traditional resources are computed by statistical aggregation of the minimum, most likely and maximum values assessed for each category of resource for all the provinces within each Area. The national total then is derived by separate statistical aggregation of all the province-level data together. This style of computation facilitates comparison of the PGC’s assessments with those of other organizations. The assessments for the individual provinces, summarized in the Area assessment tables, are considered by the PGC to be of the greatest value for purposes of planning and exploration and represent the best judgment of the Committee’s members. It is statistically incorrect to add values of varying probability. Therefore, it is improper to add most likely, minimum and maximum estimates to derive area and national totals. A simulation program therefore is required to calculate the totals. Statistical aggregations of the resource estimates in this report are made using commercially available software, @RISK (v. 3.1, Palisade Corporation, Newfield, New York). Microsoft Corporation’s Excel® spreadsheet application was used in conjunction with @RISK to input data and to assist in analyzing the results. @RISK employs simulation to derive a probability distribution of expected outcomes, based on the probability distributions of the input data. The program samples the specified input data distributions and recalculates the outcome a specified number of times (iterations). The output is a probability distribution of the results of each iteration. The sampling technique used by the PGC is termed “Latin Hypercube,” which recreates more accurately the distribution of input data, for a given number of iterations, than by the Monte Carlo sampling method. Latin Hypercube’s stratification approach divides the cumulative probability distribution of the input data into equal intervals. A sample then is taken randomly from each interval or “stratification” of the input distribution. This sampling scheme forces the representation of the entire input distribution in the calculations and, therefore, should result in convergence of the output probability distributions, which are the aggregated resource estimates. The PGC’s experience indicates that Latin Hypercube sampling converges faster and results in more stable output distributions for a given number of iterations than does Monte Carlo sampling. A minimum 1,000 iterations are run in order to aggregate PGC province data into area totals, and province totals into the national total. Triangular probability distribution functions are employed for the input probability functions using the estimated minimum, most likely and maximum values. @RISK allows for the consideration of dependency relationships among variables. While an independent variable is totally unaffected by any other variable within the model, a dependent variable is determined, wholly or in part, by some other variable within the model. The appropriate dependencies of PGC areas are estimated and included in the simulation where applicable. Latin Hypercube sampling usually is employed only with fully independent variables except, in the case of the PGC estimates, where the dependence is specified, and explicit correlation between variables is desired. Statistical handling of the 2010 assessment results is in accordance with the recommendations of the Energy Information Administration’s evaluation of domestic natural gas estimates. (11) With publication of the PGC’s 2009–10 report, tables of the PGC’s “most likely” values of Traditional and coalbed gas resources, which complement the tables of statistically aggregated means, will be provided together with illustrative graphs. Footnotes: 1. American Gas Association, 1993, Natural gas reserves of selected field in the United States and of Canada prepared by the American Gas Association and the Canadian Petroleum Association as of December 31, 1992. 2. Energy Information Administration, 2010, U.S. crude oil, natural gas, and natural gas liquids proved reserves—2009: U.S. Dept. of Energy, Energy Information Administration, Office of Oil, Gas, and Coal Supply Statistics, Rept. DOE/EIA–0216(2009) and reports for preceding years. 3. American Gas Association, 1980, Report of the Committee on Natural Gas Reserves, in Reserves of Crude Oil, Natural Gas Liquids, and Natural Gas in the United States and Canada as of December 31, 1979: American Petroleum Institute, American Gas Association, and Canadian Petroleum Association, 253 p. (also annual reports for preceding years). 4. Energy Information Administration, Natural Gas Annual, Natural Gas Monthly, Annual Energy Review and other selected reports. 5. Originally approved by the Board of Directors, Society of Petroleum Engineers, Inc., February 27, 1987. SPE’s definitions for the various categories of “reserves” subsequently were combined with definitions developed independently by the World Petroleum Congresses and adopted in 1997 as the SPE/WPC Petroleum Reserves Definitions. SPE and WPC then developed a classification system for petroleum “resources” in conjunction with the American Association of Petroleum Geologists (AAPG), to complement the reserves definitions. The combined definitions were adopted in 2000 as the SPE/WPC/AAPG Petroleum Resources Classification and Definitions. In March 2007, SPE, in conjunction with WPC (now the World Petroleum Council), AAPG and the Society of Petroleum Evaluation Engineers (SPEE), adopted a new revised edition of these definitions, released as the Petroleum Resources Management System, is available from the SPE website at http://www.spe.org/specma/binary/files/6859916Petroleum_Resources_Management_System_2007.pdf. 6. Potential Gas Committee, 1990, Definitions and procedures for estimation of potential gas resources: Colorado School of Mines, Potential Gas Agency, Gas Resources Studies No. 3, 44 p. 7. Yield factors represent the amount of gas expected to be produced from a given unit volume of rock. They are calculated using data from known gas accumulations considered analogous to that being evaluated. Yield is the volume of discovered gas (that is, cumulative production plus proved reserves) divided by the volume of productive rock containing said gas. The yield factor applied to any prospective area is adjusted to accommodate variations appropriate to the prospective area. 8. Interstate Oil and Gas Compact Commission, 2006, Untapped Potential—Offshore Oil and Gas Resources Inaccessible to Leasing: Interstate Oil and Gas Compact Commission, North American Coastal Alliance, January, 31 p. Document is available for download at http://www.iogcc.state.ok.us. 9. Coleman, J.L., C.S. Swezey, R.T. Ryder, and R.R. Charpentier, 2006, Undiscovered oil and gas resources underlying the U.S. portions of the Great Lakes, 2005: U.S. Geological Survey Fact Sheet 2006–3049, 4 p. Available for download at http://pubs.er.usgs.gov/usgspubs/fs/fs20063049. 10. Wood, G.H., Jr., and W.V. Bour, III, 1988, Coal map of North America: U.S. Geological Survey Special Geologic Map, 44 p. text, scale 1:5,000,000. 11. Energy Information Administration, 1989, An examination of domestic natural gas resource estimates: U.S. Dept. of Energy, Energy Information Administration Rept. SR/RNGD/89‑01.